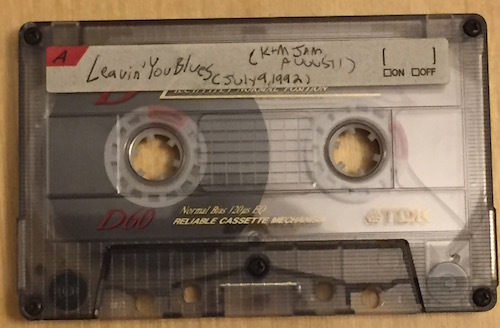 The tape has two main parts: a loooong blues-ish number with Martin Witczak on Piano and Keyboard, his brother and my high school best friend Mike Witczak on sax, and myself on tuba, where I am lamenting our eminent separation as high school ends, and then a number of smaller numbers by Mike and me, including another long bluesish bit where I try to apologize for having been a bad friend during the course of our four years at Euclid High School. 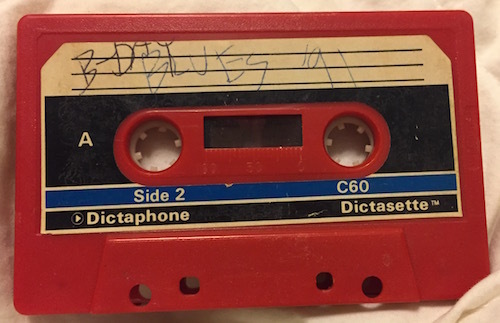 The smaller bits are trying to record specific bass lines we would jam on the bandroom piano and on our own horns; interesting that even back then the archivist impulse was evident in me. There's a lot of awkward, cringe-worthy patter that I've kept in here. (I think I was modeling myself after Tom Lehrer's pianoside remarks, a bit.) I'm not sure if my attempt to emulate a classic bluesman is a bit racist, or if I get a deferral by saying I was trying to imitate the Blues Brothers. (Specifically, I think I might be patterning my blues voice after Elwood Blues in the song "Rubber Biscuit".) Still, I guess it's not quite as bad as I'd feared. Apologies for the opening, me doing the Beastie Boys "Kick It Over Here Baby Pop" in the most annoying voice possible. And apologies for the vocals on the rest of it, for that matter. And also the tuba playing. Again, I'm not sure why my patter starts off with a bad Lawrence Welk impression and later a horrendous Tone Loc homage. Anyway, these days I call this "Chas-Jammer" so as to avoid confusion with "C Jam Blues"
I took over melody, then. I have got SO much mileage out of this 12 bar blues melody (taken from the Atari 2600 version of video game "Moon Patrol") in my current HONK!-ish era, playing it to back many many talented solists and generally jamming the heck out of it. The thing is, now I treat that line as a bassline - but here, I say it's the melody and have a simpler up-and-down-the-blues-scale riff behind it. WARNING: NSFW, a bit. I kind of hate this now, and anything that besmirches Mr. Rogers for that matter, who was a truly amazing person. This line shows up in a few of the jams. I had forgotten how important it must have been to me. The other extended piece on the tape. Mike was a great friend to me when I was the new kid at school, though neither of us fit in really well, at times. But at some point I turned into a piece of crap for a while, turning my back on him to increase my own social capital, or something. The details are mercifully murky in my memory, but it was enough of a thing that I tried to work an apology in to this number. So, all so very cringe-worthy, but still, intriguing to be from a personal history point of view. Interesting to hear how many of these basslines I'm still playing around with, most notably "Space Cadet". Also how apparently I really had a "thing" for the melody of Dvorak's New World Symphony (Movement 4) I hadn't played it for years but now I love it again. Apparently '92 wasn't our first year for this sort of thing! This track has an odd electronic beat that the other musicians generally ignore. Also I'm not sure why I bring race into it. I left on a few bit os "Nick at Night" Loony Tunes footage that the rest of the tape was filled with. Not sure what the music clip at the end was from... there were other odd injections of radio chatter and "Boys of Summer"